Has God always been God? of Jesus Christ of Latter-day Saints (www.lds.org). focus on similarities rather than differences with other Christian groups. You may even receive different answers from Mormon missionaries you question. The Mormon Heavenly Father progressed from a man into becoming a God. humans can become gods, and that God the Father was once a man (p. 56). it and I don’t know that others know a lot about it. he does not know the first principle of the gospel of Joseph Smith. - Religion 430-431, chapter 7, page 17). version, this statement is present there. parents; Jesus' grandfather and grandmother for lack of better terms. Once Was, As God Is, Man May Be" (Doctrines of Salvation, page 430). This 'truth' has become watered down in recent decades. It is now referred to as a 'couplet'. Through the Ages, 1945, p 104). Doctrines of the Gospel Student Manual, chapter 3, page 8). principles" (Achieving a Celestial Marriage Student Manual, p. 129). refute that idea, and take away the veil, so that you may see" (History of the Church, volume 6). beyond those limitations and set aside the law" (Conference Report, October 1923, page 31). February 2012, Liahona, Our Father in Heaven. The files are zipped here. God - Eternal and Everlasting or not?. is unchangeable from all eternity to all eternity" (Moroni 8:18). removed from the 2003 version of "Religion 345 - Presidents of the Church - Student Manual (p. 89). It seems like the LDS Church does not want people to know what her prophet taught before. What is your definition of "Eternal" or "Everlasting" God? love us and watch over us" (Conference Report, April 2010, page 63). The Mormon Heavenly Father is not omnipresent. is everywhere present" (Religion 430-431 - Doctrines of the Gospel Student Manual, page 8). The Mormon Heavenly Father is married to at least one Goddess wife in heaven. 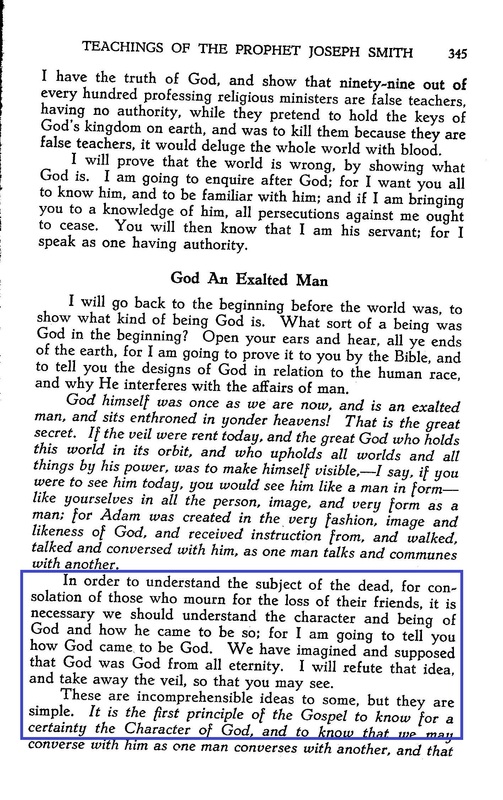 earth in a temporal [physical] body” (Gospel Principles, page 11). a more pure and refined substance" (Doctrines of the Gospel Student Manual, chapter 6, page 14). whether Heavenly Father atoned for the sins of Heavenly Mother when she was a mortal. concubines - Behold, and lo, I am the Lord thy God, and will answer thee as touching this matter." bear the souls of men; for herein is the work of my Father continued, that he may be glorified” (vv. 61, 63). will be resumed again in the future. we are" (Gospel Doctrine, page 183). he received the patriarchal blessing from Jesus' Grandfather.